Beginning with his inclusion in Edward Steichen’s Family of Man exhibition at the Museum of Modern Art in 1955, Avedon’s work has appeared in dozens of exhibitions around the world. His first solo exhibition was at the Smithsonian in 1962, curated by Eugene Ostroff. Other solo museum exhibitions followed at the Minneapolis Institute of Fine Arts in 1970, the Museum of Modern Art in 1974, The Amon Carter in 1985, and The Whitney Museum in 1994. Avedon was the first living photographer to be given two shows at the Metropolitan Museum of Art, in 1978 and again in 2002. In the 1960s, when museum and gallery shows devoted to photography were rare, Avedon had exhibitions at advertising agencies such as McCann Erickson and J. Walter Thompson. In 1975, he had a major show at the Marlborough Gallery in New York, marking an early instance of a photographer exhibiting at a fine art gallery. Following his death in 2004, major retrospectives of his work have toured throughout Europe, Australia and the United States, and his work has been shown at galleries such as Pace/MacGill, Fraenkel and Gagosian. The first retrospective of Avedon's photographs was mounted in 1962 at the Smithsonian, when Avedon was 39 years old. Solo museum photography exhibitions were uncommon at the time, and this show was afforded a small, narrow space. 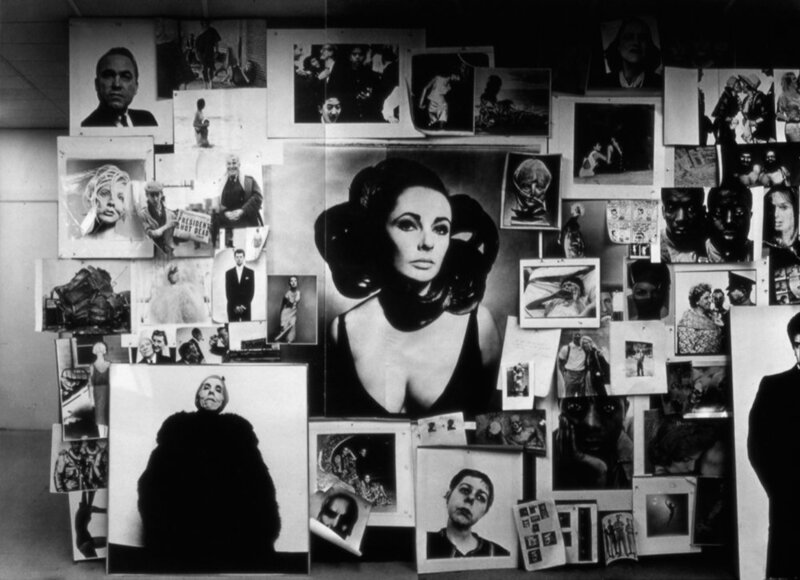 Avedon hung the show in an unusual fashion by tacking up a wide range of unframed materials directly to the walls in a seemingly random sequence, sometimes creating collages, sometimes allowing an individual picture to stand alone. This gave the exhibition a sense of immediacy and intimacy - as if it had come off the walls of Avedon's own studio - that dismantled distinctions between portraiture and fashion, which Avedon continuously juxtaposed throughout the show. Avedon had a series of exhibitions at both McCann Erickson and J. Walter Thompson, the advertising agencies, in the 1960s. As with the Smithsonian show in 1962, Avedon would tack up the exhibitions directly to the walls. 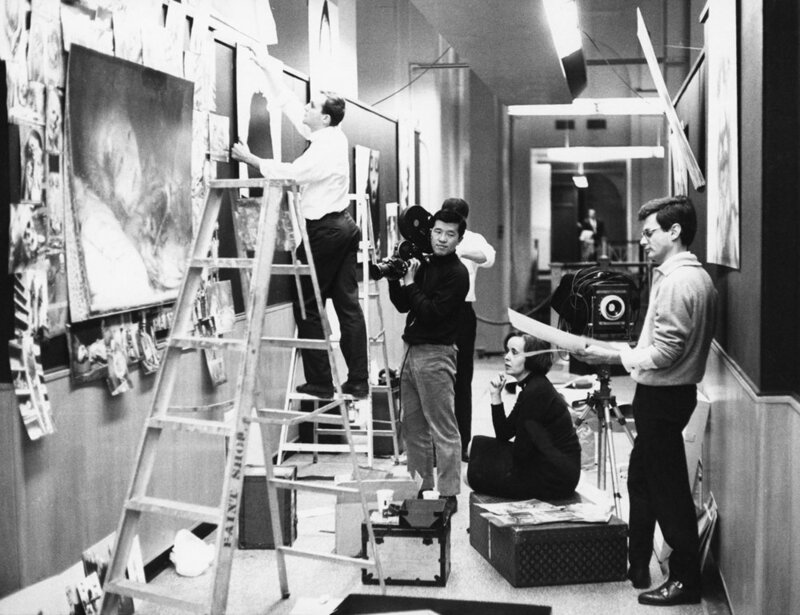 In this 1964 show at McCann Erickson, Avedon created an immense collage of portraits, fashion photographs, reportage and advertising. He also used a projector to display an array of enlarged photographs, compounding the show's dynamic and ever-changing effect. The advertising agencies provided Avedon with his first New York exhibition venues at a time when photography did not often command widespread attention. Filmmaker D.A. Pennebaker captured the opening of this show on film. 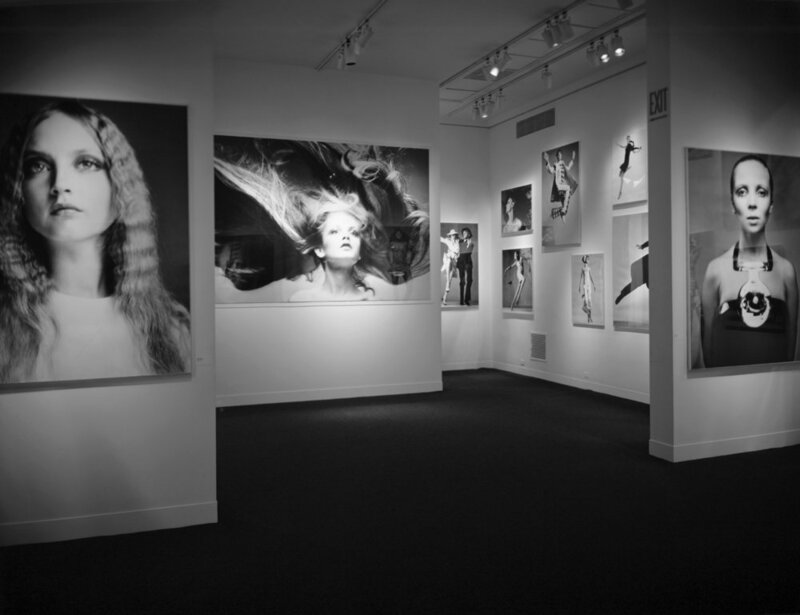 The Minneapolis Show combined Avedon's past and current work. 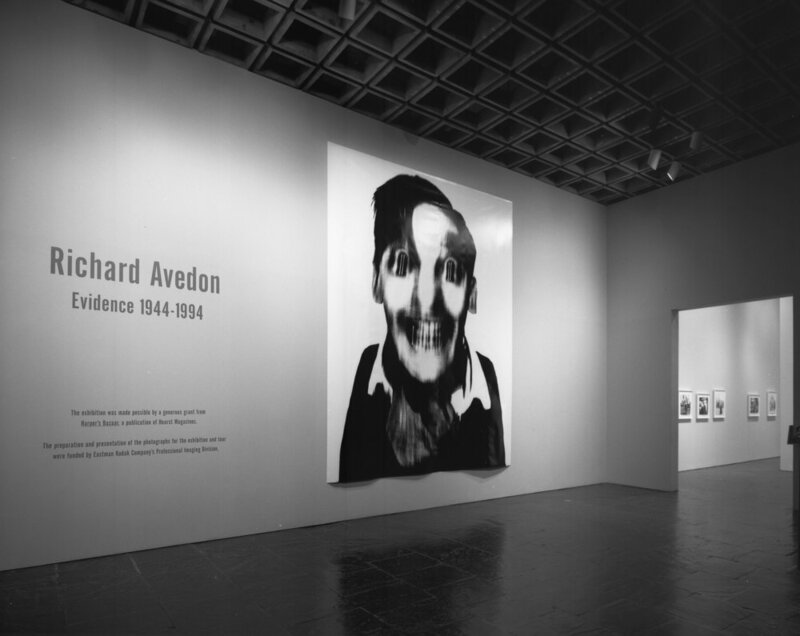 The content featured many of Avedon's portraits of political figures, and throughout the exhibition he expressed his opposition to the Vietnam War. The show was groundbreaking in both subject matter and scale, as the first of Avedon's four mural portraits, The Chicago Seven, debuted in Minneapolis, tacked directly to the wall. Avedon created a special portfolio for sale to accompany this show despite the near non-existence of any market for fine art photography at this time. The exhibition and portfolio were designed by Avedon with his long-time collaborator, Marvin Israel. After years of deliberations with MoMA's powerful photography curator, John Szarkowski, about putting on a large show, Avedon and Szarkowski created a radically personal show of just 8 photographs of Avedon's dying father, Jacob Israel Avedon, in 1974. Though tiny in size, the exhibition elicited a broad response of both praise and criticism. Avedon had had a vexed relationship with his father, who died of cancer in 1973. The eight portraits were the final collaboration of their fifty-year relationship, as Jacob Israel Avedon, who was cognizant of his imminent demise, allowed his son to photograph his final illness and death in the last eighteen months of his life. This was Avedon's first major show at a commercial art gallery. Audacious in size and scale, the Marlborough show became a landmark in both Avedon's career and in the evolution of the acceptance of photography into the fine-art sphere. More than 100 portraits, many captured in what came to be considered as Avedon's signature style of white background and black borders, were displayed and offered for sale, including the murals Andy Warhol and Member of the Factory, and The Mission Council. 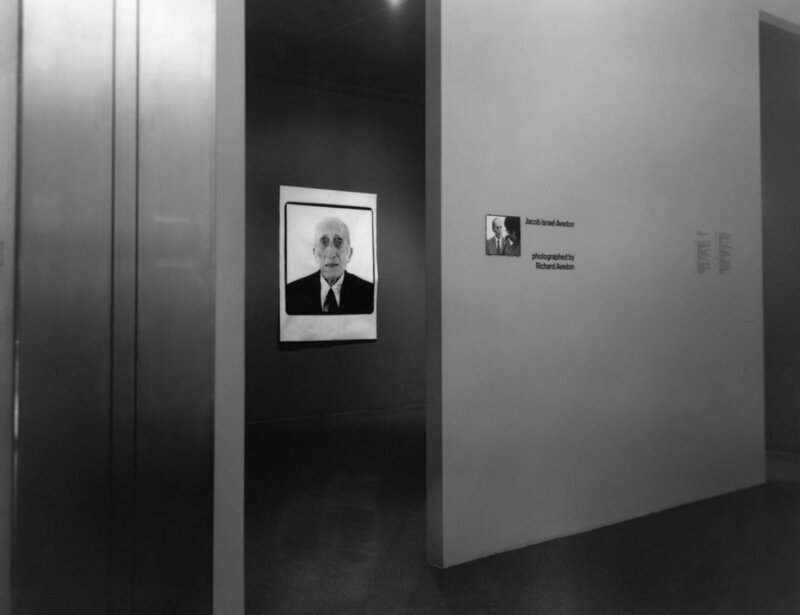 In another first for Avedon, the exhibition was accompanied by a related book, Portraits, with an essay by the noted art historian Harold Rosenberg. Though conceived as a commercial show, the exhibition traveled to several museums, including The Art Center College of Design in Pasadena, The Seattle Art Museum, and the Seibu Museum in Tokyo. In 1978, Avedon became the first living photographer to ever be granted a show at The Metropolitan Museum of Art. Equally as important, the exhibition was a retrospective of Avedon's fashion photography, which conferred legitimacy on both the medium of photography and the genre of fashion. The exhibition was widely covered in the press, and Avedon appeared on the cover of Newsweek when the show opened. Like the Marlborough Show, this exhibition also traveled, and iterations were seen at the Dallas Museum of Fine Arts, the High Museum in Atlanta, and the Isetan Museum in Tokyo. A catalogue was published to accompany the show, with an essay by Harold Brodkey. A career retrospective that covered all areas of Avedon’s photography, it was Avedon’s initial collaboration with the curator and museum director David Ross. The first of Avedon’s photographs from In the American West debuted at Berkeley, an oversized portrait of Boyd Fortin, the rattlesnake skinner. The show was disrupted (though not closed) when Avedon’s 30-foot-long mural of Andy Warhol and Members of the Factory was vandalized by a visitor who tossed an iodine-filled balloon at Warhol’s head, destroying the photograph. Avedon was given a singular museum commission in 1978, when the Amon Carter Museum approached him to do a series of portraits of ordinary people living in the west. Over the course of five summers, Avedon traveled the western United States by car, photographing over 800 people. This group was subsequently culled down to approximately 120 images. In the American West opened at the Amon Carter in 1985 in an installation that was site-specific to the museum. The show was accompanied by a major catalogue. Versions of the show toured to the Corcoran Gallery of Art in Washington, DC, the San Francisco Museum of Modern Art, The Art Institute of Chicago, the Phoenix Art Museum, The Institute of Contemporary Art in Boston, and the High Museum of Art in Atlanta. Following the fall of the Berlin Wall in November of 1989, Avedon traveled to Germany over New Year’s to visit and attend the celebration at the Brandenburg Gate, which had previously divided Germany into East and West. Like most of Avedon’s reportage photographs, they are not documentary in nature, but rather depict a series of portraits in context, each one containing a part of a compelling and historic narrative. The Brandenburg Gate photographs, initially commissioned and published by Égoïste Magazine, were grouped into a portfolio of 17 prints, many of them printed at very large scale, and exhibited at the Carnegie Museum. Richard Avedon: Darkness and Light. In 2002, at the age of 79, Avedon became the only living photographer to have been given two shows at The Metropolitan Museum of Art. This portrait retrospective of 180 photographs was the perfect complement to Avedon’s 1978 Met show, and what Avedon called “a dream.” The show highlighted distinctive pairings of Avedon’s work, expressing the powerful but fragile humanity of his many sitters throughout the decades. The show was accompanied by a catalogue of the same name, with writings by Richard Avedon, and curators Maria Morris Hambourg and Mia Fineman. This exhibition – which toured throughout Europe before ending at the San Francisco Museum of Modern Art – was the first posthumously organized retrospective following Avedon’s death in 2004. It was curated by Helle Crenzien, with an accompanying catalogue. Tour locations included the Jeu de Paume in Paris, The Fondazione Forma in Milan, and the Fotografiemuseum, Amsterdam (FOAM). Organized and curated by Paul Roth during the American 2008 presidential election cycle, this show focused exclusively on 180 of Avedon’s portraits of the political and the powerful throughout the decades, from Charlie Chaplin to Barack Obama. It was accompanied by a catalogue with essays by Renata Adler, Frank Goodyear, III and Paul Roth. The exhibition toured to the San Diego Museum of Art. Curated by Carol Squiers and Vince Aletti, this career retrospective of Avedon’s fashion photography opened in New York City and toured to the Detroit Institute of Arts and the Norton Museum of Art in West Palm Beach, FL. The show contained 170 prints – many of them rare – and the comprehensive exhibition catalogue featured essays by Squiers and VinceAletti. This David Adjaye-designed show at Gagosian 21st Street brought together Avedon’s four mural-sized photographs (The Chicago Seven, Andy Warhol and Members of the Factory, The Mission Council, and Allen Ginsberg’s Family), as well as related photographs and archival materials from the Richard Avedon Foundation. 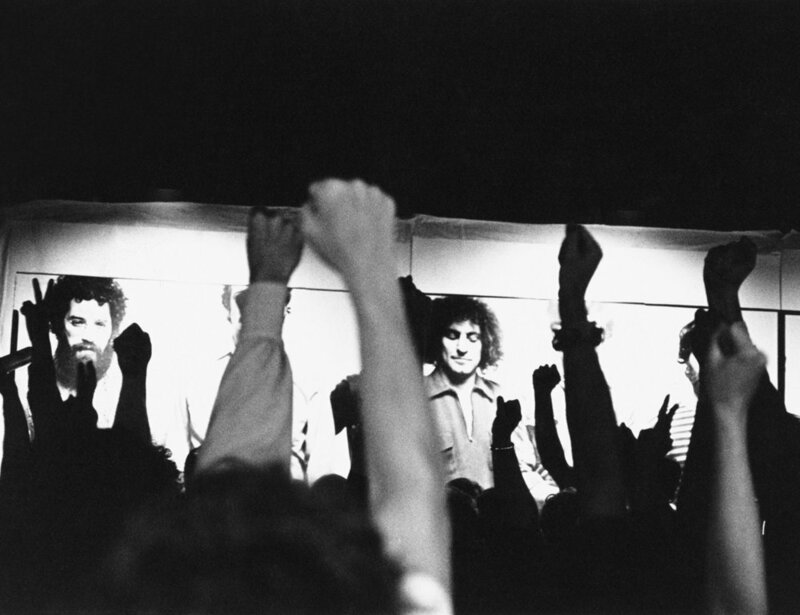 The show catalogue contained an essay on each mural written by Louis Menand (The Chicago Seven), William Shawcross (The Mission Council), Paul Roth (Andy Warhol and Members of the Factory) and Bob Rubin (Allen Ginsberg’s Family). Avedon: Women provided an in-depth look at six decades of Avedon’s career in fashion, portraiture and reportage. More than one hundred of never-published contact prints, drawn from his personal archives, revealed the tremendous variety of sittings of women captured through Avedon's lens. The accompanying exhibition catalogue featured essays by Joan Juliet Buck and art historian Abigail Solomon-Godeau. Curated by the National Portrait Gallery’s Senior Curator, Dr. Christopher Chapman, in partnership with The Richard Avedon Foundation, Richard Avedon: People was the first exhibition of Avedon’s work in Australia. The exhibition put on display 80 black and white photographs of people, know and unknown, from 1946 to 2004. The exhibition went on to tour at the Art Gallery of Western Australia and the Ian Potter Museum of Art at the University of Melbourne. Shown exclusively at Gagosian’s Brittania Street location in London, the Avedon/Warhol show juxtaposed the two artists and the common elements and themes that run throughout their work. The exhibition explored notions of power, transgression, alienation, mortality, and celebrity. The catalogue contained essays by Ara Merjian and Michael Bracewell. Curated by Bob Rubin and designed once again by David Adjaye, this Avedon exhibition at the Bibliotéque nationale de France explored Avedon’s long association with France and its culture and intellectual life. Starting immediately after World War II, Avedon embarked for France and began a body of work that sought to probe France’s resurrection and rapid change. The 800-page catalogue contains essays by Bob Rubin and Marianne LeGalliard, the latter writing on Avedon’s unique relationship with French photographer J.H. Lartigue. Selected specifically for Guild Hall of East Hampton, Avedon’s America displayed more than 50 prints from the photographer’s archive. 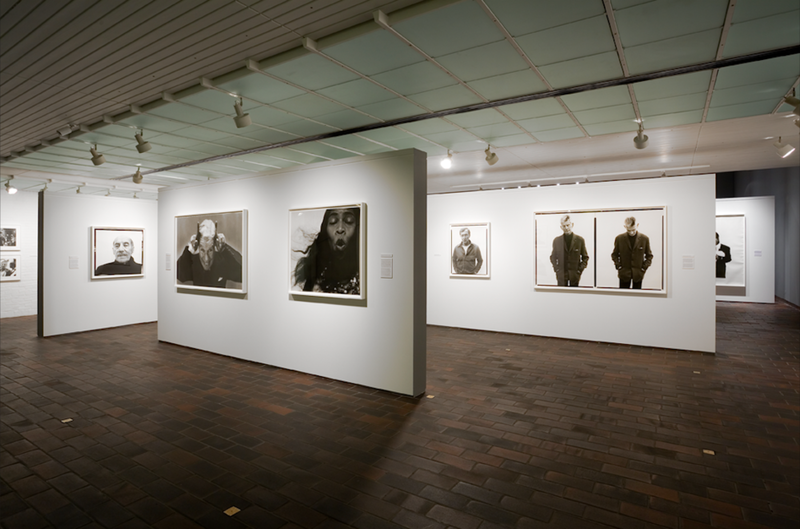 The show highlighted the faces and personalities of a broad spectrum of Americans, and featured many of Avedon’s well-known fashion, portrait, and civil rights work, in addition to many images rarely exhibited or seen outside of publication.